Everyone can be an entrepreneur! You no longer need a fat savings account, rich benefactor or angel investor to start a business by doing what you love. Thanks to the internet, it's never been easier to make money by sharing your passion with the world. But all the options can seem confusing and overwhelming, particularly if you're not a technical whizz or have never had a business before. Should you sell on a website like Etsy or eBay, or have your own online shop? What laws and regulations do you need to know about? How do you make sure people can actually find your shop? 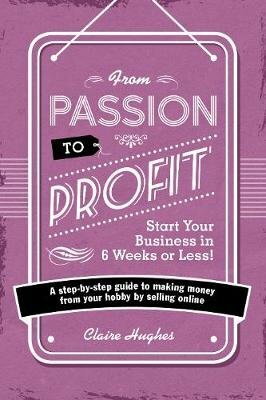 This book walks aspiring creative business owners right through the process of deciding what to sell, developing a brand, choosing the right platform and getting an online shop live in six weeks or less - without a computer engineering degree or spending hundreds of pounds. It's a step-by-step guide that combines practical information, worksheets and checklists with the gentle encouragement and support so often needed by creative entrepreneurs. A directory of online marketplaces and online shop solutions will help you to decide the best options for you to sell online, while case studies and real life stories from successful online shop owners prove that you can be successful too! This book isn't going to tell you how to quit the day job overnight or earn millions in your first year. It's a practical, step-by-step guide to get you from IDEA to ACTION...in rapid time. By the time you finish this book, you will have an online shop up and running, and be ready to take orders from customers around the world.